Sunday Update: Universal's Despicable Me 2 led the way this weekend with an estimated $82.5 million. That brings the film's five-day start to a massive $142.1 million. The five-day start for the highly anticipated sequel from Illumination Entertainment just out-paced the $141.04 million five-day start of 2010's Toy Story 3 (which debuted on a Friday). Despicable Me 2 also slightly outpaced the recent $82.43 million opening weekend performance of Monsters University, which is especially impressive given that Monsters University opened on a Friday (Monsters University grossed $105.29 million during its first five days). Despicable Me 2 claimed the third largest ever unadjusted Independence Day weekend debut (behind only the $97.85 million take of 2011's Transformers: Dark of the Moon and the $88.16 million gross of 2004's Spider-Man 2). Making the film's start even more impressive is that like 2010's Despicable Me; Despicable Me 2 was far less expensive than the typical computer animated film from production companies such as Walt Disney Animation, Pixar and DreamWorks Animation. Despicable Me 2 has shown some signs of early front-loading in its initial days of release, though that isn't really much of a concern given that the film is outpacing its already lofty pre-release expectations. The five-day to three-day weekend ratio for the film came in at 1.72 to 1. With a strong A rating on CinemaScore and none of the late summer's many upcoming family options expected to be sure fire blockbusters, it is likely only a matter of time before daily holds for Despicable Me 2 really begin to stabilize. The audience breakdown for Despicable Me 2 skewed heavily towards female moviegoers (60 percent) and towards moviegoers under 25 (55 percent), which suggests that the film could be relatively stronger on weekdays going forward. Disney's The Lone Ranger finished in a very distant second place this weekend with an estimated $29.4 million. The western starring Johnny Depp and Armie Hammer grossed $48.94 million in its first five days of release. Clearly, the film's performance has been very disappointing, given both pre-release expectations and more importantly, the film's enormous cost. Scheduling The Lone Ranger against Despicable Me 2 always seemed to be a risky proposition and there is no question that the PG-13 rated Lone Ranger lost out to the PG-rated Despicable Me 2 with family audiences in a very big way. The five-day start for The Lone Ranger was much more in line with the $40.14 million start of 2009's far less expensive Public Enemies than it was with the type of performances typically seen by big budget releases over Independence Day weekend. After a soft start on Wednesday, The Lone Ranger did stabilize on Thursday, though that stabilization was short lived as the film wasn't able to build momentum once the weekend arrived. The film registered a five-day to three-day weekend ratio of 1.66 to 1. When combined with the film's B+ rating on CinemaScore, it does appear that The Lone Ranger is playing significantly better with audiences than it has with critics. At the same time overall word of mouth still appears to be mixed and the poor critical reviews are helping keep moviegoers away to begin with. Skewing towards older and more rural moviegoers could boost the film's holding power a bit going forward, but not to the type of extent needed to make up for the film's poor five-day start. Holding up very nicely this weekend was Fox's The Heat. The R-rated comedy starring Sandra Bullock and Melissa McCarthy fell just 36 percent to place in third with an estimated $25.0 million. This weekend's hold was especially impressive given that the film faced competition from both Despicable Me 2 and The Lone Ranger. Both Bullock and McCarthy have strong recent histories when it comes to holding power at the box office and it appears that The Heat won't be any different. The Heat has grossed $86.39 million in ten days, which is very strong given the film's modest price tag for a high-profile summer release. The film is currently running 25 percent stronger than the $69.16 million ten-day start of 2009's The Proposal (which fell 45 percent in its second weekend to gross $18.58 million). It was a tale of two different performances this weekend for fellow blockbusters Monsters University and World War Z. Disney's Monsters University took a massive hit from Despicable Me 2 as it fell 57 percent to place in fourth with an estimated $19.6 million. On the other hand, Paramount's World War Z fell 39 percent to round out this weekend's top five with an estimated $18.2 million and likely benefited a bit from moviegoers who were looking for a live-action Independence Day alternative to The Lone Ranger. To date, Monsters University has grossed $216.13 million in 17 days, which is in line with the higher end of expectations. Meanwhile, thanks in part to stronger than expected holding power, World War Z continues to outpace expectations with a 17-day take of $158.76 million. Lionsgate's Kevin Hart: Let Me Explain was off to a very strong start this weekend with an eighth place estimated take of $10.1 million. Through five days of release the comedy concert documentary has grossed an excellent $17.46 million. Let Me Explain was only playing in 876 locations this weekend, which gave the film a healthy $11,530 per-location average over the three-day frame. Let Me Explain has already far exceeded the $7.71 million lifetime gross of last year's Laugh at My Pain. Much like Despicable Me 2, Let Me Explain was relatively front-loaded towards Wednesday and Thursday, as it had a five-day to three-day ratio of 1.73 to 1. However, in the bigger picture the early front-loading doesn't mean much for Let Me Explain given the size of the film's five-day start. The timing of Let Me Explain is perfect for Kevin Hart, as the comedian will be transitioning into a leading actor in the very near future with upcoming films such as Ride Along and About Last Night. The audience breakdown for Let Me Explain skewed towards female moviegoers (55 percent) and towards moviegoers 25 and older (54 percent). The film received a strong A rating on CinemaScore. A full list of this weekend's official studio estimates can be found here. Saturday Update: Despicable Me 2 added another $30.2 million to its impressive opening on Friday. That shifts the domestic gross up to $89.7 million since Tuesday night's previews, putting it on pace for a strong $80.5 million 3-day weekend. By the end of Sunday, BoxOffice projects the sequel will have amassed around $140 million--giving Despicable Me 2 a shot at the best 5-day start ever for an animated title (currently held by Toy Story 3's $141.04 million). Disney reports that The Lone Ranger grossed $10.66 million yesterday as it heads for a $30.5 million 3-day weekend. The big-budget western adaptation has performed below expectations, which were already muted in comparison to the larger numbers the film really needs to become financially successful. With a projected $50 million 5-day bow through Sunday, the flick will begin a somewhat challenging march toward $100 million domestically. Meanwhile, Kevin Hart: Let Me Explain added another $3.74 million to its limited release haul. With $11.1 million in the bank after just three days, it has already surpassed the $7.7 million lifetime gross of Hart's 2011 feature, Laugh at My Pain. BoxOffice is projecting a $10 million 3-day weekend for Let Me Explain, making for an impressive $17.4 million total 5-day bow. Friday Update: Despicable Me 2 continued to lead the daily box office with ease on Thursday with an Independence Day take of $24.5 million. The computer animated sequel from Universal and Illumination Entertainment has grossed a massive $59.5 million in its first two days. It should be noted that the Wednesday estimate for Despicable Me 2 has been revised upwards to $35.0 million. BoxOffice is currently projecting a five-day start in the range of $146 million - $152 million, which would outpace the film's already lofty pre-release expectations. Despicable Me 2 did drop a sizable 30 percent on Thursday, but that was likely largely a result of family audiences turning their attention towards other holiday activities. Even with the percentage decline, Despicable Me 2 claimed the second largest unadjusted July 4th performance ever (behind only the $29.07 million Wednesday take of Transformers back in 2007). Expect Despicable Me 2 to pick back up nicely today. Despicable Me 2 has received a very encouraging A rating on CinemaScore, which is a good sign for the film going forward. Disney's The Lone Ranger stabilized on Thursday with a second place take of $9.85 million. However, in the bigger picture the expensive western starring Johnny Depp and Armie Hammer is off to a very disappointing two-day start of $19.50 million. The Lone Ranger was up a solid 2 percent over Wednesday's performance, a sure sign that the film is skewing heavily towards older moviegoers and not drawing in family audiences. After Thursday's stronger than expected hold, BoxOffice is currently projecting a five-day start in the area of $49 million - $54 million. With a respectable B+ rating on CinemaScore, it does appear that the poorly reviewed film is going over better with audiences than with critics. On the heels of Wednesday's much stronger than anticipated start, Lionsgate's Kevin Hart: Let Me Explain did drop a sharp 46 percent on Thursday to gross $2.59 million. While the comedy concert documentary looks to be quite front-loaded in its initial days of release, the film is still off to an impressive $7.36 million two-day start (especially since it is only playing in 876 locations). BoxOffice is projecting a five-day take in the area of $15 million - $18 million for Let Me Explain. In comparison, last year's Laugh at My Pain grossed $7.71 million during its entire domestic run. Thursday Update #2: Despicable Me 2 grabbed an impressive $34.3 million on Wednesday. BoxOffice projects that the animated flick could end up anywhere between $150 million-$155 million during its first five days of release. Universal touts that DM2 is the 8th highest Wednesday opening ever, 3rd highest opening day for an animated feature including Friday debuts, and the biggest Wednesday opening for Universal. Overseas, Despicable Me 2 has grossed $65.9 million as of July 3. DM2 opens in 38 new territories this weekend.The film opens today in Argentina, Chile, Croatia, Czech Republic, Denmark, Germany, Hong Kong, Hungary, Israel, Malaysia, New Zealand, Peru, Portugal, Singapore, Slovakia, Trinidad, Thailand and Venezuela. On Friday, DM2 hits Austria, Brazil, Bulgaria, Columbia, Cyprus, Finland, India, Mexico, Norway, Panama, Romania, South Africa, Ecuador, Paraguay, Uruguay and Spain. Disney reports that Lone Ranger grossed only $9.7 million on Wednesday. BoxOffice projects that the action flick is now on pace for an underwhelming $48 million-$50 million over five days. Projections have dropped steadily since Wednesday, so it's clear that negative word of mouth is in fact taking hold. Star Johnny Depp is officially on a cold streak. He also failed miserably with last summer's Dark Shadows. Lone Ranger is a huge disappointment for Disney, but the success of Iron Man 3 and Monsters University this summer definitely softens the blow. Kevin Hart: Let Me Explain snagged $4.75 million on Friday. BoxOffice projects a five-day haul between $17 million-$19 million. That's an impressive start for the Lionsgate release, especially considering its playing at only 876 locations. 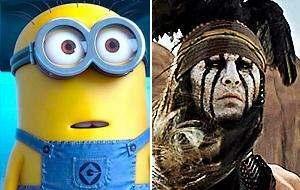 Thursday Update #1: Sources tell BoxOffice that Despicable Me 2 took in $32 million on Wednesday. Universal's animated flick is now on pace for $88 million from Friday-Sunday and $140 million from Wednesday to Sunday. As of Tuesday, DM2 also has $60 million in the bank overseas. At this rate, DM2 could pass its predecessor's $543 million global haul after two weeks or so. The Lone Ranger took in an underwhelming $12 million on Wednesday. Disney's action flick looks to be headed for $38 million from Friday-Sunday and $60 million from Wednesday-Sunday. Right now, it seems like paying moviegoers don't hate the film quite as much as critics. More than 52,000 Flixster users have combined to give Lone Ranger a lukewarm 73% approval rating. Kevin Hart: Let Me Explain is still finding a sizable audience in the shadow of tentpoles. The comedy took in a solid $5 million on Wednesday. Let Me Explain should do $10 million from Friday-Sunday and $18 million from Wednesday-Sunday. Wednesday Update #2: Early grosses indicate that Despicable Me 2 is headed for a massive first day. Sources tell BoxOffice that the animated sequel is set for as much as $33 million on Wednesday. That would top the $30.4 million first day of Monsters University, but it's not quite on par with the $41.1 million first day that Toy Story 3 managed. DM2 could end up hitting $140 million or more during its first five days. The Lone Ranger is looking at around $12 million on Friday. Disney's action flick is harder to peg with a wave of negative reviews already poisoning its word of mouth. If the Johnny Depp vehicle doesn't experience a word-of-mouth decline, then it could end up somewhere north of $60 million. Lionsgate's Kevin Hart: Let Me Explain is off to a great start. The comedy is set to snag as much as $5.5 million on Wednesday, which means that it could reach $20 million over five days. Hart definitely has a very bright career ahead of him. The young comedian has a slew of projects set to open soon, including Ride Along, a buddy cop comedy with Ice Cube. The strong performance of Let Me Explain marks another win for Lionsgate following the success of Now You See Me. Wednesday Update #1: In an early sign of what's to come over the holiday frame, Despicable Me 2 is already way ahead of The Lone Ranger. Universal reports that the animated sequel took in $4.7 million from Tuesday evening shows compared to just $2 million for The Lone Ranger. Despicable Me 2 easily trumped the $2.6 million haul that Monsters University raked in from Thursday previews. That bodes well for DM2 considering that Monsters University tallied a healthy $82.4 million during its debut frame. BoxOffice forecasts that DM2 could hit $130 million during its first five days in theaters, a sum that would help July start off on a very strong note. The animated flick already has at least $50 million in the bank overseas thanks to strong showing in the U.K. and Australia, among others. There's little doubt that DM2 will easily exceed the $543 million global haul of its predecessor. The Lone Ranger failed to match the $3.6 million Thursday evening haul of World War Z, another star-driven film plagued by poor early buzz. Critics have not only maligned The Lone Ranger for being tone-deaf and too long, but many are also quick to point out how violent it is. That's not a good sign for family-friendly Disney. TLR had enough to worry about with Despicable Me 2 stealing away the attention of families with young children, but warnings from critics could keep even more families away now. BoxOffice forecasts that TLR will take in $47 million over its first five days.